It's Tuesday and already and interesting week. On Monday I started a second job. I am working one day a week at the sister school to where I work now. (Hymba Yumba). It's only a 45min drive from home, but unfortunately it is almost a 2 hour bus/train/bus commute. Which brings me to my second item. I just picked up a 'new' scooter. I am a bit surprised Barb actually let me get a motorbike. On the plus side it makes getting to work much easier and it is actually cheaper than public transit. (It's also kinda fun to drive). 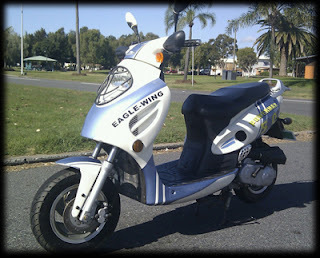 It is a 2007 Eagle-Wing Power Max 50. I love the fact that a 50cc scooter is "Power Max". It keeps up with traffic quite well and can be driven with just a regular car license. On the flat it will hit 65-70 km/h, but on steep hill the speed drops down to 35-40. I got it for $1000 and spent almost 1/4 of that on a helmet and gloves. Today also seems my day to be losing things. I left my sunglasses on the train when I went to pick up the scooter. Then on the way back I lost my cell phone somewhere between Chermside & Wynnum. I back tracked part of the way to look for it, but I think it is gone for good. As luck would have it I at least have a spare phone. Just last week Optus was having a deal where you can get a Samsung Galaxy Tab and Galaxy S for a two contract of $59. I already pay $49 for my current phone plan so that worked out to be only $240 more. I've wanted to get a tablet for a while now, but we didn't really have the extra cash to spend something that is just a toy. I was planning on keeping the Tab and then selling the 'S'. As long as I could get $240 for the phone, I would be getting a free tablet. Now that my old HTC HD2 is no more, I now have a Galaxy S.
And finally, as I write this my mother is in the Grande Prairie airport waiting to board an AirCanada flight to Calgary, then Los Angeles, and finally Brisbane. She will be visiting for a month. It will be good to see her, plus she is bring 'real' marshmallows and ice tea mix among other goodies :-). Rob and I were watching Corner Gas the other night, the episode where Lacey wins the perogy eating contest. Perogies are endemic to the prairie provinces, but scarce as hen's teeth in Australia. (and btw, the computer's dictionary wanted to replace "perogy" with petrology or peroxides. Dictionary just got SCHOOLED) The thought of Corner Gas and 'rogies got me a little homesick. And then I thought, "but I have an AWESOME recipe!" So Sunday afternoon, I made about five dozen and invited some folks from church over for supper. SOOOOO GOOD. After mentioning the episode on Facebook a few people asked for the recipe, so here it is! and knead into an elastic dough. Roll out a handful at a time to 1/2 cm thick. Use the biggest glass you own to make circles. Put in about tsp-tbsp of filling in center, fold over and pinch the edge together (a little water will help seal the dough edges). Throw all those puppies into a big pot of boiling water, and let them go for about 5 minutes, or until they all float. Serve with caramelized onions, farmer's sausage, chives, bacon bits and sour cream or more butter. They freeze well. They are NOT low fat or low calorie. But they are pure love in a dumpling, to quote a friend. Yes I have tried Vegemite. No, it's not very nice. More for my Aussie buddies, then!